This problem was originally identified by Microsoft here. But none of the fixes recommended by them were really practical in my clients situation. I did read one promising post that said, if you disable offline file caching by GPO this problem would cease. However this particular client HAD TO have that feature enabled (for Ranger Offline). Someone else had written a PowerShell script that ran through and changed the permissions on the offending file (see below), but what about new users? 1. 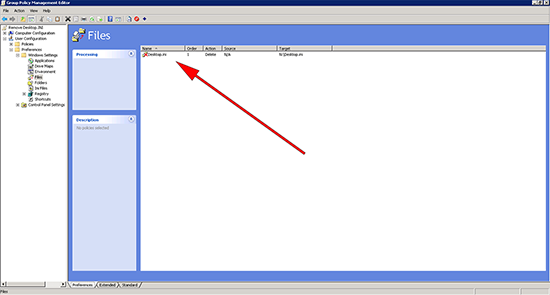 This is the file in question ‘desktop.ini’, it changes the icon and display-name of the folder (on Windows Vista and newer). 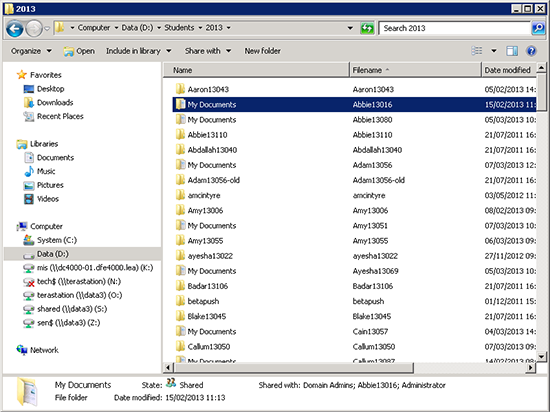 You will notice the actual name of the folder does not change (see the example I posted above), which you can see by turning on the filename column in Windows Explorer. Note: desktop.ini is a system and a hidden file. 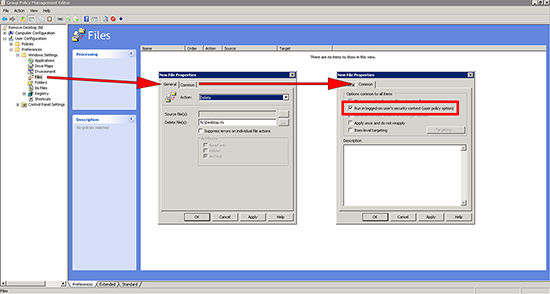 Select New > File > Action = Delete > Source Files N:desktop.ini > Tick ‘Suppress errors on individual file actions’ > Common Tab > Tick ‘Run in logged-on-users’s security context (user policy option)’ > Apply > OK.
3. It should now look like this. 1. 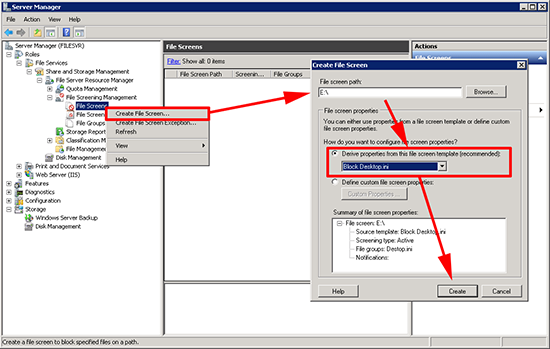 You need to have the ‘file services’ role installed, open the ‘Server and Storage Management’ Snap-in > File Group > Create File Group > Give it a name > Add in desktop.ini > OK.
2. 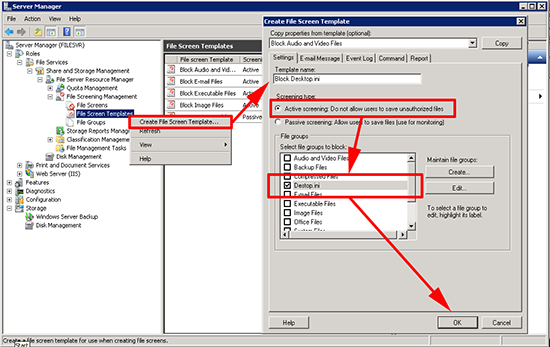 Right click ‘File System Templates’ > Create File Screen Template > Give it a name > Select Active Scanning > Tick desktop.ini > OK.
3. 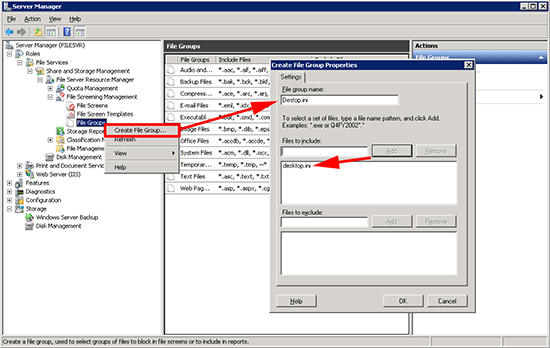 Right click ‘File Screen’ > Create File Screen > Browse to the volume or Folder > Select your file screen template > Create. Download and run this PowerShell Script to remove all instances of Desktop.ini from a folder and subfolders.